This sporty vest features button front styling, two roomy patch pockets, and soft elastic shirring in center back. Center back length: 29". This great fitting, adjustable rise, moderate flare leg maternity pant features a soft and stretchy tummy panel which grows with you! Double needle topstitching edges the knit panel, double cargo pockets, and back pocket and side vents finish this look. Our comfy Maternity styles are designed to support and flatter using your current size, so no need to size up. When ordering Cherokee Maternity styles, remember to order your pre-pregnancy size. Regular inseam: 31". Petite inseam: 28½". Tall inseam: 34". 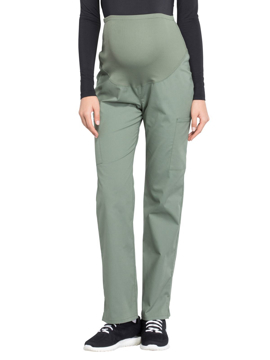 This unique maternity top features an adjustable drawstring, empire waist and soft stretchy knit side panels. Contrast topstitching on the front and back princess seams, a patch pocket, pager pocket and hidden pocket finish this picture. Our comfy maternity styles are designed to support and flatter using your current size, so no need to size up. When ordering Cherokee Maternity styles, remember to order your pre-pregnancy size. Center back length: 27". 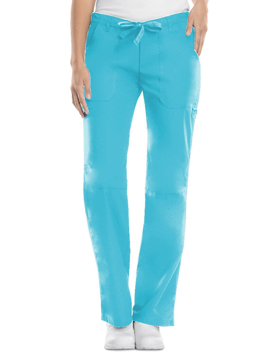 This mid-rise, moderate flare leg pull-on pant features a knit spandex waistband reinforced with inside elastic for extra support and elasticity. Also featured are contrast slash pockets, a cargo pocket with a stitched down pen slot and a contrast cell phone pocket. Regular inseam: 31". Petite inseam: 28½". Tall inseam: 34". This mid-rise, straight leg cargo pant with two slash pockets and one cargo pocket features a tab closure detail for added security. The elastic waistband is covered with matching soft knit for comfort. Regular inseam: 31". Petite inseam: 28½". This innovative top shapes and slims the body! V-neckline, front and back yoke with soft and stretchy side panels in contrast color knit. Two hidden pockets. Center back length: 24½". 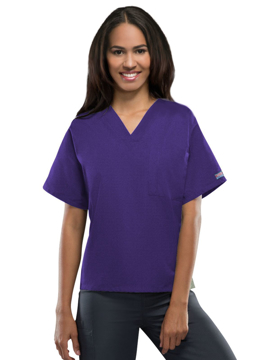 This sporty V-neck features a front yoke, patch pockets with a snap tab closure for added security and matching stretchy knit side panels for comfortability and a slimming look. Center back length: 26". 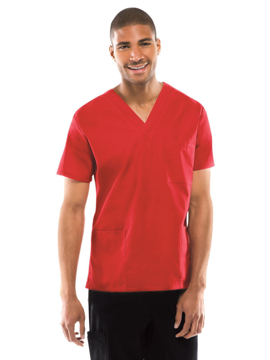 This crew neck scrub top features an athletic fit, chest zipper pocket, rib-knit neckband and back panels, and triple-needle topstitching. Center back length: 29½". This warm-up jacket features an athletic fit, signature logo zipper pull, front and back shoulder yokes, front welt pockets, rib-knit collar, cuffs, and waistband. Center back length: 27½". 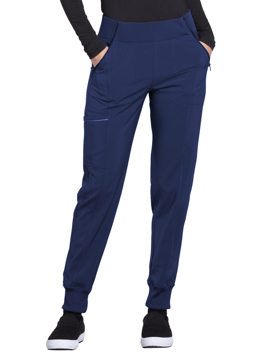 This tapered leg pant features an elastic waistband with functional drawstring, mock zip fly, side-seam zipper pockets, back zipper pocket, and hidden inseam gusset. Regular inseam: 32". Short inseam: 29½". Tall inseam: 35". This v-neck top features an athletic fit, chest zipper pocket, rib-knit neckband and back panels, and triple-needle topstitching. Center back length: 29½". A men’s athletic fit zip front warm-up jacket features back side panels, collar, cuffs and waistband made with a stretch rib knit for extra comfort. Also featured are a logo zipper pull, front chest pocket with security zip closure, patch pockets, and an instrument loop and sectional pocket on the left sleeve. Center back length: 28”. 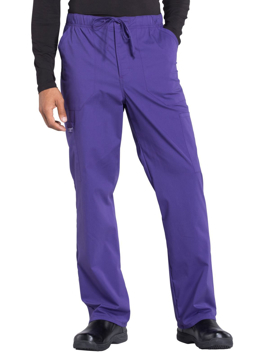 This jogger pant features tapered leg styling, rib-knit elastic waistband and leg bands, front angled zipper pockets, back patch pockets, and a cargo pocket with reflective tape. Regular inseam: 28". Petite inseam: 25½". Tall inseam: 31". 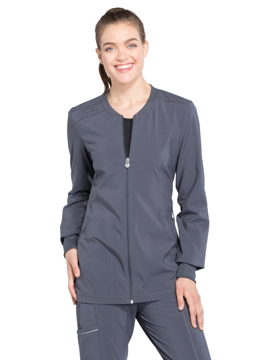 This mock wrap top features two set-in front pockets, a logo O-ring above left pocket, left scissor pocket, one interior pocket, front and back princess seams and side vents. A stretch rib knit at the center back panel gives this top its slimming shape and allows for extra movement and comfort. Center back length: 26". A round neck top with rib inset front neckband features shoulder yokes, a bungee I.D. badge loop on the right shoulder, front and back princess seams, two patch pockets, one interior pocket, and side vents. Stretch rib knit at the center back panel gives this top its slimming shape and allows for extra movement and comfort. Cover-stitch detail throughout. Center back length: 26". A contemporary fit v-neck top features a rib waist inset and stretch rib knit panel at the center back for a slenderizing effect, as well as for extra movement and comfort. Also featured are two patch pockets, an interior pocket, pencil stitch, bungee I.D. badge loop, front and back princess seams, a shirttail hem, side vents and coverstitch detail throughout. Center back length: 26”. 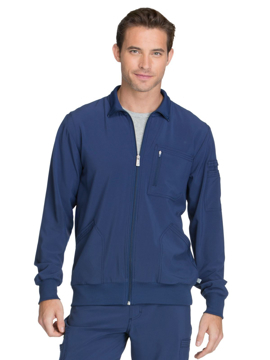 This warm-up jacket features a zip closure with logo zipper pull, two set-in front pockets, right interior pocket, bungee ID badge loop on right shoulder, logo o-ring, and rib-knit collar and cuffs. Center back length: 27". This separating zip front jacket has two hidden chest pockets in a yoked front. A sewn-in belted back waist is accented with released pleats and is vented above and below the waist for movement. Two roomy patch pockets. Center-back length 32". 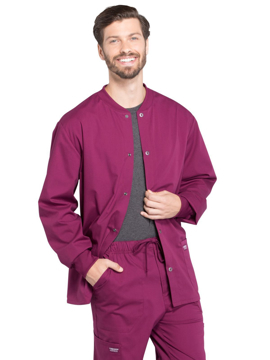 This unisex fit, button front lab coat features a notched collar, a chest pocket, and two lower patch pockets with side entry for easy access to pant pockets. A back yoke and kick pleat complete this coat. Center back length: 38". This unisex lab coat features two roomy patch pockets, a chest pocket with a pencil stitch and vented back. This style #1346 features the regular fabric. Center back length: 40". This unisex lab coat features two roomy patch pockets, a chest pocket with a pencil stitch and vented back. This style #1346AB features the Certainty Plus® fabric. Center back length: 40". This unisex lab coat features two roomy patch pockets, a chest pocket with a pencil stitch and vented back. This style #1346A features the Certainty® fabric. Center back length: 40". This button front lab coat is edged with lace on its collar, notched lapel and center back belt. Princess seaming and two patch pockets detail the front and back, and the three quarter length sleeves sport cuffs. Center back length: 29". This notched lapel lab coat features three quarter sleeves ending in cuffs. Princess seaming provides easy shaping. Also featured are two patch pockets, side vents and center back belt with button detail. This style #1470 features the regular fabric. Center back length: 30". 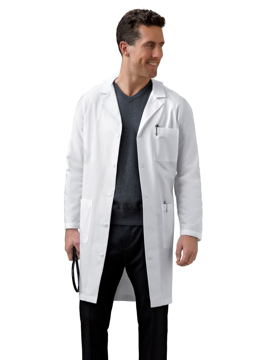 This notched lapel lab coat features three quarter sleeves ending in cuffs. Princess seaming provides easy shaping. Also featured are two patch pockets, side vents and center back belt with button detail. This style #1470AB features the Certainty Plus® fabric. Center back length: 30". This notched lapel lab coat features three quarter sleeves ending in cuffs. Princess seaming provides easy shaping. Also featured are two patch pockets, side vents and center back belt with button detail. This style #1470A features the Certainty® fabric. Center back length: 30". 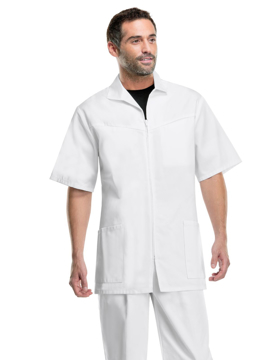 A longer length, 32" lab coat with notch collar and a multitude of pockets; chest pocket, two patch pockets, beeper pocket and inside cell phone pocket. Center back length: 32". This stylish lab coat comes with a notched lapel, two patch pockets, a chest pocket, button back detail for shape, and side vents. Center back length: 32". This professional lab coat features a classic notched lapel collar with three outside patch pockets and one inside pocket. Front and back princess seams create a flattering and slimming look. Center back length: 37". This stylish lab coat features a notched lapel, two patch pockets, a chest pocket & button back belt detail for shape, side vents, and knit cuffs. This style #1362 features the regular fabric. Center back length: 32". This stylish lab coat features a notched lapel, two patch pockets, a chest pocket & button back belt detail for shape, side vents, and knit cuffs. This style #1362AB features the Certainty Plus® fabric. Center back length: 32". This stylish lab coat features a notched lapel, two patch pockets, a chest pocket & button back belt detail for shape, side vents, and knit cuffs. This style #1362A features the Certainty® fabric. Center back length: 32". This natural rise, elastic waist pant with reinforced drawstring also features a functional zip fly, four side cargo pockets, two slash pockets and a back patch pocket. Regular inseam: 31". Petite inseam: 28½". Tall inseam: 36" unhemmed. 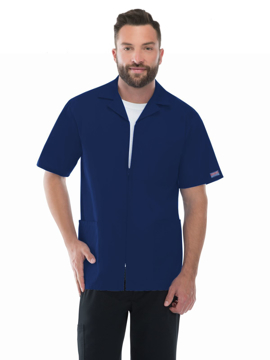 This men's v-neck top features a chest pocket with bartacked pencil slot, set-in sleeves, back yoke, side vents, and double needle detailing. Center back length: 29". A zip front jacket sports a lapel collar, chest pocket and two patch pockets. Center back length: 30½". This casual unisex pant features a natural rise and an adjustable webbed drawstring waist, one back pocket, and a cargo pocket with an inside cell phone pocket. Regular inseam 31". Petite inseam: 28½". Tall inseam: 33½". This unisex V-neck top has one chest pocket and two patch pockets. Side vents. Regular center back length: 29". Tall center back length: 32". This dolman sleeve, v-neck unisex tunic has a chest pocket with a pencil slot. This is the most popular top for both men and ladies. Center back length: 27½". Side vents at the bottom of this natural rise, flare leg pant make a fashion statement. An adjustable front drawstring, back elastic waist, slash pockets, and one back patch pocket are also featured. Regular inseam: 31 ". Petite inseam: 28½". Tall inseam: 34". This low rise, straight leg, drawstring pant with an elastic waist features a contemporary fit. Two front pockets, a d-ring on the left cargo pocket, an extra cargo pocket and one scissor pocket, leg seaming detail at the knee, five belt loops and double needle top stitching complete this extraordinary pant. Regular inseam: 31". Petite inseam: 28½". 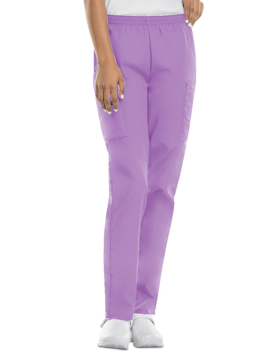 A contemporary fit, mid rise, straight leg pant features a comfort-fit rib knit waistband reinforced with inside elastic for extra support, and front patch pockets with rib knit insets for expandability without sagging. Also featured are two cargo pockets, a pencil stitch, hidden instrument loop, back pockets and side vents. Regular inseam: 31". Petite inseam: 28½". Tall inseam: 34". This elastic waist utility pant features a natural rise and tapered leg, two cargo pockets, a cell phone pocket and an outside scissor pocket. Regular inseam: 30". Petite inseam: 27½". Tall inseam: 33". This jacket features two patch pockets, right cellphone pocket, snap closure, and knit cuffs. Center back length: 28½". 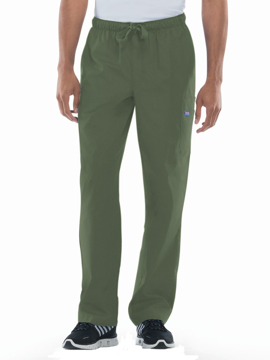 This drawstring pant features an elastic waistband with functional drawstring, zip fly with button closure, two front patch pockets, two cargo pockets, back pocket, and tapered leg styling. Regular inseam: 32". Short inseam: 29½". Tall inseam: 35". This classic v-neck top features a chest pocket with instrument loop, and side vents. Center back length: 28". This classic v-neck top features a chest pocket, two patch pockets, right cellphone pocket, hidden instrument loop, and side vents. Regular center back length: 29". Tall center back length: 32". 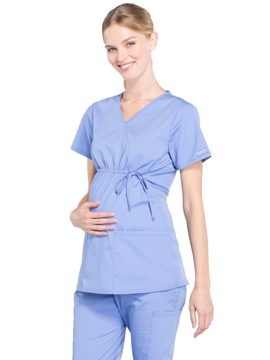 This maternity mock wrap top features two patch pockets, empire waist with side-tie drawstring, and stretch rib-knit side panels. Center back length: 27½". 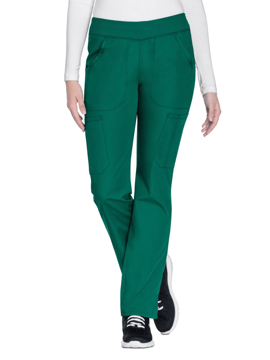 This maternity pull-on pant features a stretch rib-knit panel waistband, two cargo pockets, right cellphone pocket, back pocket, straight leg styling, and side vents. Regular inseam 31". Established in 2009. 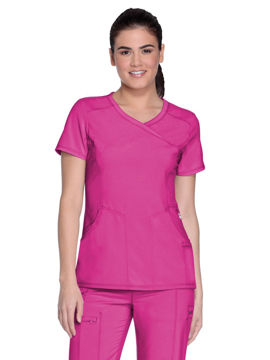 Scrub Authority has the latest styles and greatest selection of medical scrubs and nursing uniforms. 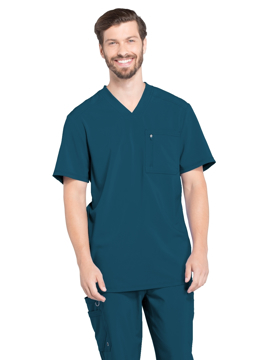 From tops, pants, and jackets to surgical hats, shoes, and medical accessories, the products ScrubAuthority.com have you covered from head to toe. Copyright © 2019 Scrub Authority. All rights reserved.